The following information was slightly edited from a Minnesota Department of Agriculture news release. 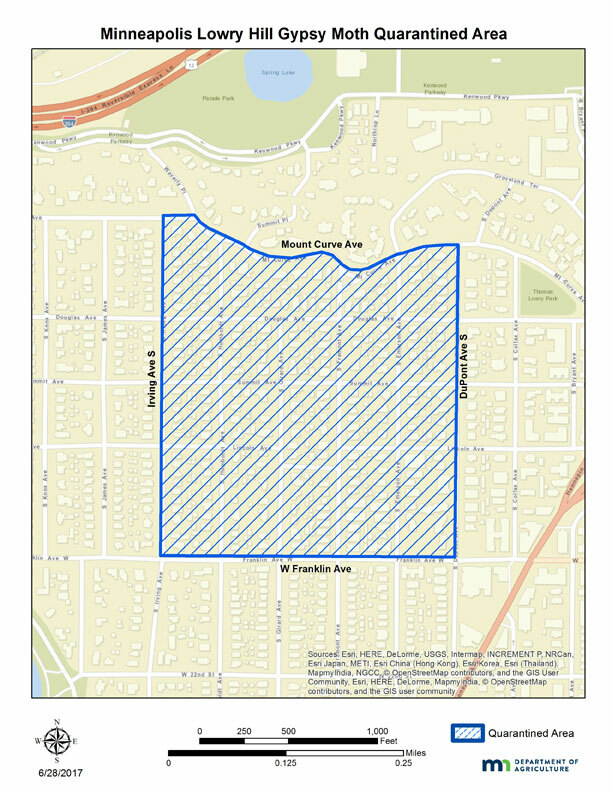 The Minnesota Department of Agriculture (MDA) is placing a gypsy moth-infested area in the Lowry Hill Neighborhood of Minneapolis under quarantine beginning July 1 after a neighborhood resident reported a large insect population. The quarantine will be in place until early next summer. The MDA was contacted earlier this month by a resident in the neighborhood who suspected a gypsy moth infestation after he noticed caterpillars on trees. MDA staff conducted a survey and found thousands of gypsy moth caterpillars that had already started defoliating trees. Gypsy moths have caused millions of dollars in damage to forests in the eastern United States. The moths are common in Wisconsin and are now threatening Minnesota. If present in large numbers, gypsy moth caterpillars can defoliate large sections of urban and natural forests. They feed on over 300 different types of trees and shrubs. What does the temporary quarantine do? The quarantine restricts the movement of trees and woody material, including firewood, out of the area. Trees may be pruned, but all branches and woody material must stay on the property (even if limbs are chipped, gypsy moth eggs are still viable). Grass clippings can be removed from the area. The quarantine requires self-inspection of any equipment, household items, or vehicles that are sitting outside in the quarantined area and are being moved out of the quarantine. This includes items such as wood pallets, patio furniture, grills, and trampolines, as well as trucks, campers, and boats. Residents should look for gypsy moth egg masses which are brown, fuzzy blobs the size of a quarter. They should scrape the egg masses off the item or leave the item where it is. A mature gypsy moth caterpillar. Photo: MN Dept. of Ag. The gypsy moths likely came to Minneapolis through the movement of infested wood or outdoor items. This raises the importance of the quarantine. Residents can help contain this pest by not moving branches, firewood, or outdoor items out of the quarantined area. 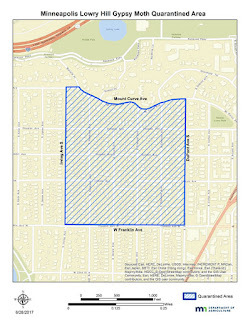 To provide more information, the MDA will be hosting an open house about the quarantine. Tuesday, July 11, 6:30-8:00 p.m. The MDA has set up gypsy moth traps throughout the area to determine the extent of the infestation. Next year the MDA plans to treat the area for gypsy moths and will then lift the quarantine. The department will provide more information this winter about the proposed treatment, which is similar to treatments done in Richfield and Minneapolis in 2016, and Minnetonka, Eden Prairie and Edina in 2011. For more information regarding the quarantine or gypsy moth, visit www.mda.state.mn.us/gypsymoth. If you suspect a gypsy moth infestation in your area, contact the MDA’s Arrest the Pest line at 1-888-545-6684 or arrest.the.pest@state.mn.us. To see the original MDA news release, go here.